The most important memorial site in Trieste, Italy. 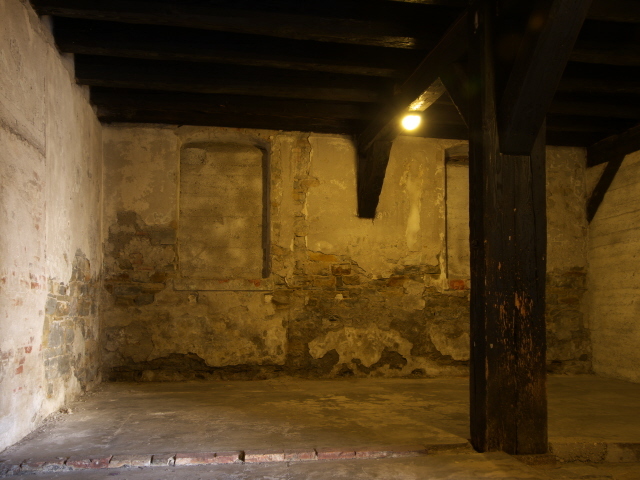 It's a former rice-husking mill that between 1943 and 1945 was used by the occupying Nazi Germans as a concentration camp for Jews and political opponents. Thousands were killed here and the camp even had its own crematorium. But the camp also served as a transit camp – namely for deportations of victims to other camps in Germany or Poland. More background info: San Sabba is the name of a district of Trieste south of the centre, originally almost on its outskirts and once a busy industrial area. The industry has since declined and much of the area has undergone redevelopment, except for the still active nearby steelworks. 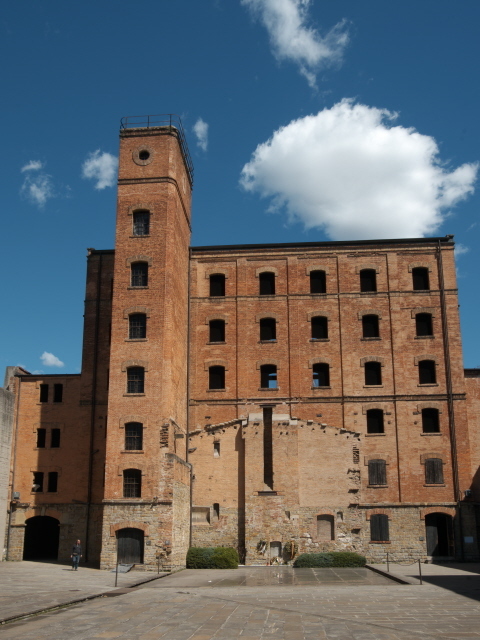 The Risiera, as the name implies, was originally a rice-husking factory, constructed in 1898, expanded in stages by 1913 (the main building dates back to that year), and remained in operation until 1934. After that it was used by the military, initially for storage, from 1940 also as a barracks. 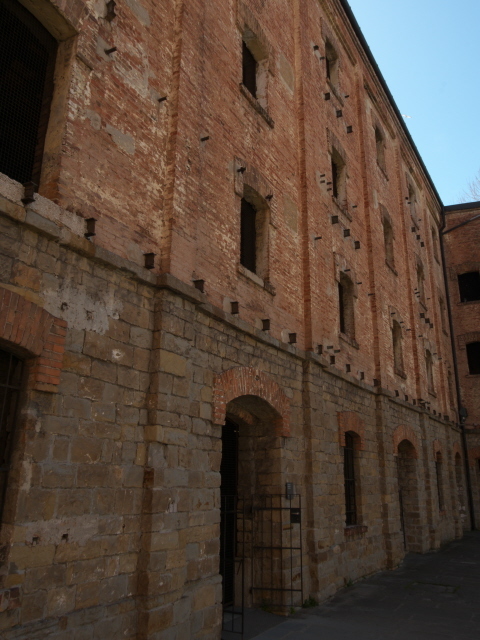 When Nazi Germany occupied northern Italy including Trieste in 1943, the former Risiera was turned into a prison. Initially this was for Italian soldiers captured in the wake of the Italian surrender to the Allies in September 1943. But soon after the prison was turned into a “Polizeihaftlager”, i.e. effectively a concentration camp. It housed political prisoners, partisans, anti-fascists and Jews. With regard to the latter group, the Risiera primarily served the function of a transit camp, i.e. Jews imprisoned here were mostly deported onwards to other camps in Germany and Poland, including Auschwitz. Deportees were taken by truck to Trieste's central railway station and then transported onwards by train. In total between just under 10,000 and over 20,000 are assumed to have transited through the Risiera for deportation. Amongst the SS men who set up and operated the Risiera camp were some of the most infamous names of the Nazis, such as Odilo Globočnik, Christian Wirth and Franz Stangl, who previously had all had key positions in the T-4 euthanasia programme and then the Aktion Reinhard before being sent to Italy (see esp. Belzec, Treblinka, Hartheim and Grafeneck). Many victims also lost their lives at the Risiera itself, mostly through executions but also due to the harsh conditions. Estimates of the overall death toll at the Risiera are uncertain, but usually range between 2000 and 5000. 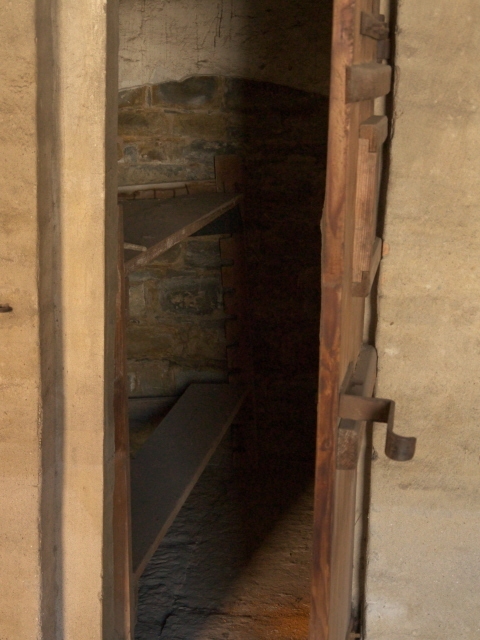 The Risiera was also the only concentration camp on Italian soil that had its own crematorium (whereas other Italian camps, such as Fossoli, did not have such a facility). The camp was liberated on 29 April 1945. As the Nazis fled they destroyed the crematorium and its chimney. After WWII, the site was used as a refugee camp for people who had fled from countries beyond the Iron Curtain. 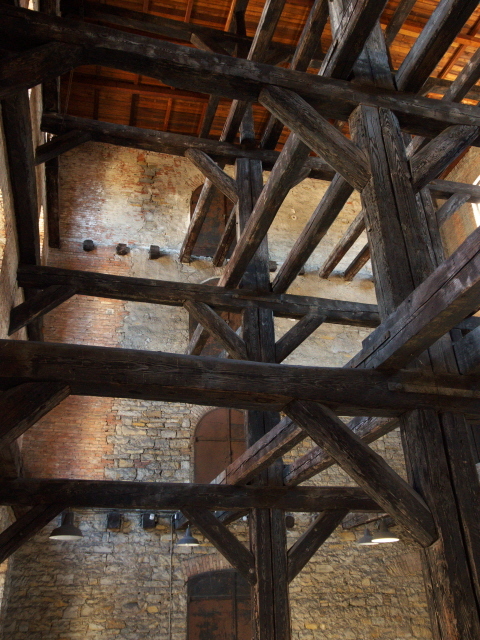 It wasn't until 1965 that the Risiera di San Sabba was declared a National Monument. The site opened as a memorial in 1975. It utilizes only a portion of the original building complex. Other parts of the complex were demolished, now providing space for an adjacent car park. In its original incarnation, the memorial was mostly abstract and “silent”, meaning: with very little actual information about the site's history. And what words were used rather emphasized “Italian martyrdom”, especially that of partisans and liberators, but failed to acknowledge the place's role in the Jewish Holocaust. In that sense the memorial must have resembled equivalent memorializations at such sites in the Eastern Bloc and the USSR. In fact, the Risiera was up to then primarily a site supported by the Italian left. The reliance on silent symbolism and shrine-like nature of the memorial was also quite typical for Italy, though, e.g. 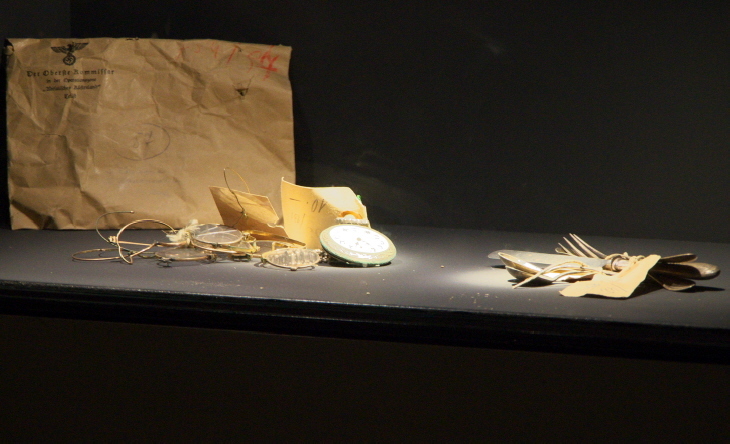 going by the old Italian “exhibition” at Auschwitz I that I visited in 2008 and also found surprisingly abstract and devoid of any explanations. It wasn't until the mid-1990s that at least a few information panels were put up. Until then the site had suffered from severe underfunding and was largely ignored by the local population. During the late 1990s this slowly began to change, with a record high in visitor numbers of 50,000 a year. Before coming to the Risiera di San Sabba I had read an interesting academic article that compared the Risiera and the Foiba di Basovizza as “competing” memorials, whose narratives both showed serious deficiencies, erroneous estimates and misleading omissions. (For more on that article see the chapter for the Foiba, in particular the >background section). That article had been published in 2014, and was based on research conducted between 2007 and 2013. So it described the memorial at the Risiera the way it was before the new general exhibition was opened in April 2015 (other sources say January 2016). And I am happy to report that much of what had been criticized about the commodification at the Risiera has meanwhile been rectified! 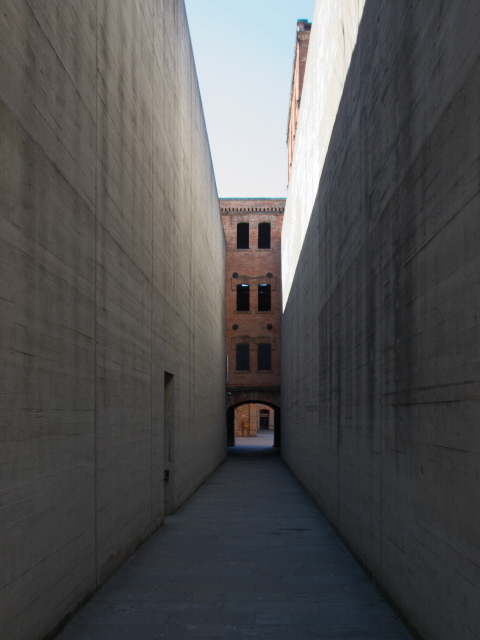 What there is to see: From the entrance to the site by the road you have to take a long passageway with high concrete walls on either side, but no roof, to get to the actual buildings. This I found reminiscent of the “Schlauch” recreation at Belzec (see also under Treblinka!). Whether that was the intended effect or not I cannot say. At the memorial's office and small shop you can rent an audio-guide (available in English) and purchase some books and brochures. One general descriptive brochure about the Risiera memorial in English (3 EUR) includes all the static text panels from the main exhibition and numerous photos (but none of the screens' contents). The audio-guide is of good quality, narrated by a native speaker of English, and covers all the various subsections of the site and provides plenty of extra background information, and as such is therefore quite useful. But it's not essential. At the heart of the memorial is the main courtyard in front of the six-storey main brick building of the old rice mill. More high concrete walls close the gaps between the buildings so you can't see out (or in). In the back is a tall steel monument that symbolizes the smoke stack of the crematorium. The place where the crematorium used to stand (it was blown up by the Nazis as they evacuated the site) is marked by a hollow “footprint” of the structure covered by metal sheets, and you can also see the outline of its wall where it joined the main building. Set into the wall is a memorial stone with wreaths placed in front and to the side of it. The four-storey side wing of the complex contains some of the original structures still in place. 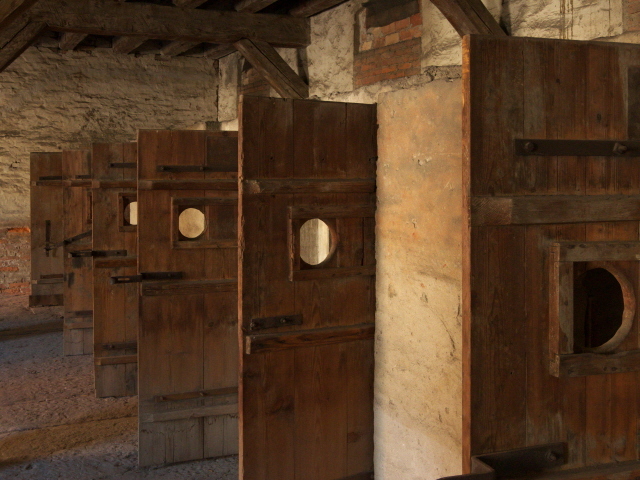 Amongst these are the “death cell”, where those condemned to death had to await their executions. Next door there is a row of 17 small individual cells. Apparently these were not just single isolation micro-cells but were actually crammed with up to six inmates per cell. 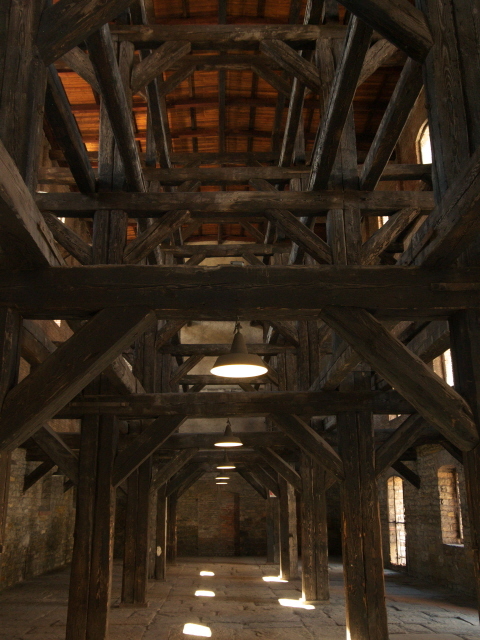 In the building next door to that is the largest of the indoor parts of the memorial: here the boards of the upper floors have all been removed so that the wooden beams and pillars are visible right up to under the roof. 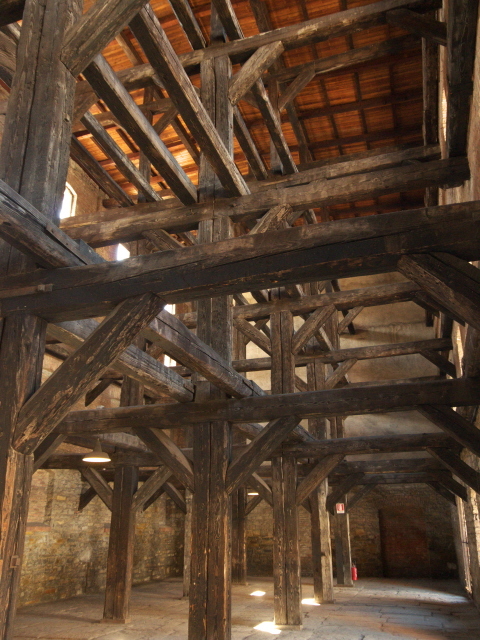 Because of the shape of these wooden supports this is called the “Hall of Crosses”. On a wall there are a couple of display cabinets. One has a small glass urn with soil from Jerusalem, the others a number of objects “pillaged by the Nazis from Jewish houses in Trieste” as a multilingual sign explains (these were returned to this site as donations in the early 2000s). All other labels/information panels dotted around are in three languages: Italian, Slovenian, and English. The museum exhibition, completely overhauled and opened in 2015/16, is on the ground floor of the main tall former rice mill building. None of the upper floors in any of the buildings are accessible. There are also static text panels, again all in three languages: Italian, Slovenian and English. They provide just about the right amount of information, avoiding information overload but neither are they too superficial. A good balance. Their content is topically wide-ranging, from the prehistory of the site as an industrial building, the creation of the concentration camp under the Nazis, the various groups of victims, the perpetrators, and so on. Unlike in the previous commodification of this site (see above), the new exhibition now also has sections about the historical context before the arrival of the German Nazis, i.e. that of Italian fascism and its own anti-Semitism as well as all the repressive measures against Slovenes and Croats in addition to territorial annexations (cf. Rab, Pula, Kobarid). More specifically the Jewish context is also topicalized, from the long-established Jewish community of Trieste to the Shoah. Furthermore the tricky issue of Italian collaborationism with the German Nazis is not swept under the rug but given some space too, as is the story of the resistance and the partisans. Finally there is an account of the evolution of the Risiera as a memorial site from 1965 to the present day. 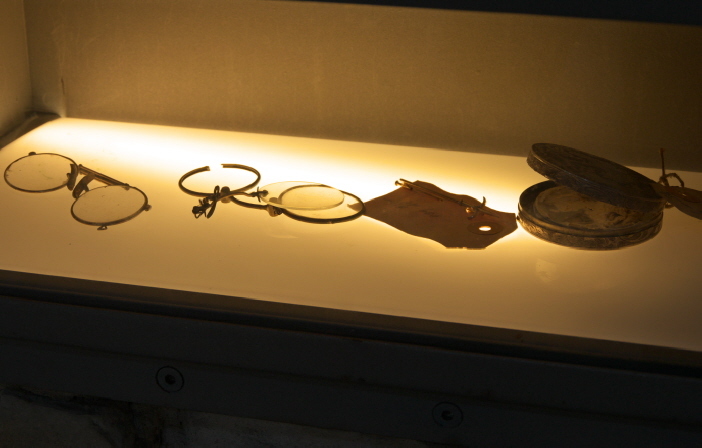 The exhibition also has a few (but not many) artefacts on display, including personal effects of inmates (spectacles, watches, etc. ), documents, a cane for beatings, and so forth. One display cabinet has striped concentration camp clothes – though not from the Risiera, where no such striped clothes or badges were worn, but from former inmates and survivors of the camps of Mauthausen, Buchenwald and Auschwitz, who had presumably been deported there from Trieste. Also on display is a large glass urn with ashes from Auschwitz, representing those who did not survive. 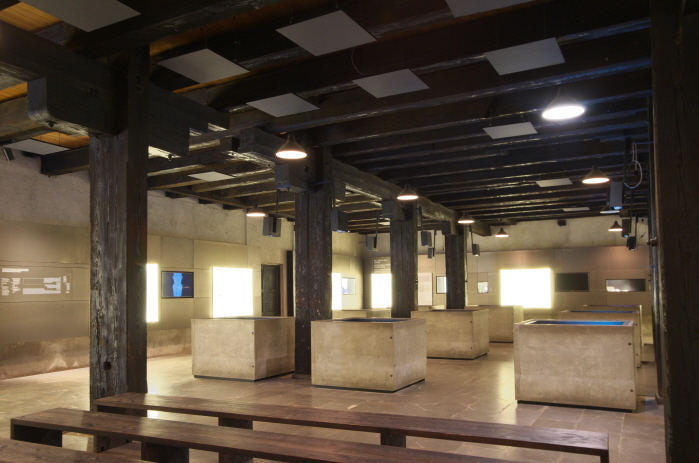 Separate from the main museum exhibition is another, secondary exhibition in the former garage building of the site, now designated “commemoration room”. On the concrete walls outside are various plaques by specific groups, including one from Slovenia, and another commemorating one group of victims that is otherwise not acknowledged in the site's commodification, namely homosexuals. Inside the actual commemoration room is an extra exhibition consisting of a series of text-and-image panels, all in Italian only. They are mostly about a number of individuals who were imprisoned at the Risiera, from what I could make out. In addition there are a couple of sculptures and an altar-like concrete structure in the centre. All in all, I found the site more impressive and convincing than I had anticipated from what I had read about it before coming here. The new main exhibition is definitely a highly valuable addition that manages to overcome previous flaws in the commemorative commodification of the Risiera. 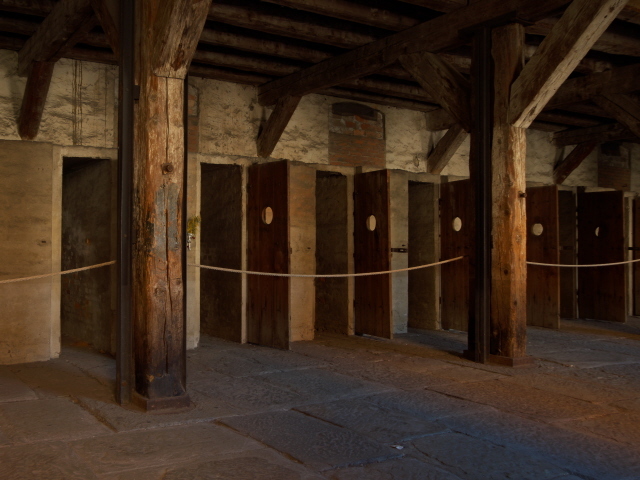 Some of the original structures are also visually moving, and the whole atmosphere is adequately sombre and intense. I would even say that of all the sites in Italy I've seen that are related to the dark chapters of fascism, the Nazi occupation and the Holocaust, this is possibly the best. Location: on the edge of the city of Trieste, Italy, ca. 2.5 miles (4 km) south of the centre, in a former industrial area that's undergone some substantial redevelopment, with a hypermarket and a large stadium now in the direct neighbourhood of the memorial. Access and costs: a bit out of the centre requiring a drive or taxi/bus ride; free. Details: The location of the memorial isn't especially convenient. From the city centre of Trieste it's out of walking range, so if you don't have your own means of transport, you'll either have to get a taxi, or take the bus. There is a bus stop right outside the memorial's entrance but that line is of little use. However, you can get bus line 10 from Piazza Tommaseo, right in front of the Greek Orthodox Church, just a short walk from the central Piazza Unità d'Italia. It's 18 stops to Via di Valmaura 37, from where it's another short walk: carry on in the direction the bus was going and cross the street and turn left into Via Giovanni Palatucci. The entrance to the memorial is at the end of that street. If you are driving your own (or hire) car, you can find some parking spaces round the corner along Via Rio Primario or use the large car park of the shops just beyond the memorial. Opening times: daily from 9 a.m. to 7 p.m. Admission free. Audio-guide: 2 EUR (plus you have to produce some form of ID). Time required: A couple of hours, possibly even longer if you want to read and watch everything in the main exhibition and also want to use the audio-guide to the full. 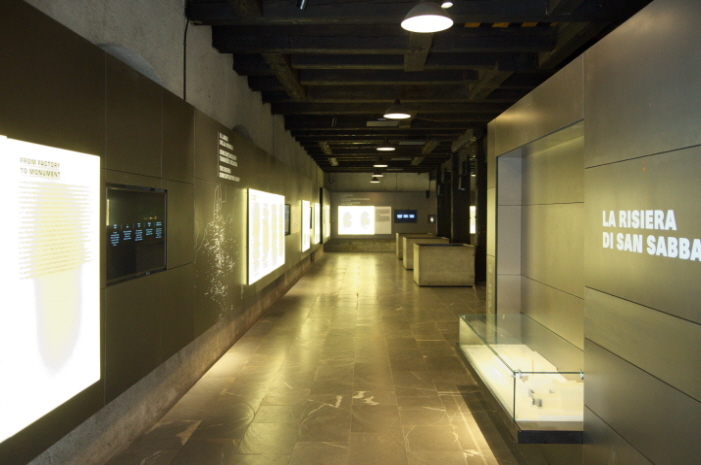 Combinations with other dark destinations: Some sites in Trieste can be seen as associated with this memorial, such as the Jewish museum or the synagogue. Yet the memorial site it is in most direct competition with is of a very different nature: the Foiba di Basovizza (see also background!). See also under Trieste, Italy and neighbouring Slovenia and Croatia. Combinations with non-dark destinations: see under Trieste.